Last week, I was trying to get back into my blue jeans and this week, my calendar tells me that Christmas is only two weeks away. December is not off to a very productive start. If, like me, your to-do list is long and time is short, let me offer a little inspiration for a thoughtful and delicious gift that can be crossed off your list in no time flat. For friends and family with a sweet tooth, try the candied pecans. Made with just egg white and sugar, they disappear quickly if left in plain view on the counter. If they survive the nibblers, scatter them over salads for some sweet crunch. I particularly like them served with mixed greens, orange suprêmes and goat cheese with a light vinaigrette or sprinkled over a classic roasted beet salad with blue cheese. For those on your list that prefer a savory indulgence, the recipe for spiced pecans is the way to go. I like these on salads as well. They are the perfect accompaniment to a salad of poached pears and mixed greens or any salad with fried quail or shrimp. Like their sweet counterparts, these won’t last long and are a great small bite to pair with holiday cocktails. Whether you go sweet or savory, be sure to make extra. Otherwise, you’ll find yourself eating your gifts and will be right back where you started again. Happy cooking…and gifting! There is nothing tricky about roasting nuts except remembering to check them. Always set a timer. Nuts have a tendency to go from perfectly roasted to very, very burnt as soon as you turn your attention to something else. Preheat the oven to 350 degrees. In a small bowl, combine all of the ingredients for the spiced pecans and toss to coat. Spread the pecans on a parchment-lined baking sheet and bake for 10 to 15 minutes until golden brown and fragrant. Remove from the oven and cool. Store pecans in an airtight container. The use of cooking spray is imperative even with the use of parchment paper. For best results, be sure to spread the pecans out on the baking sheet. 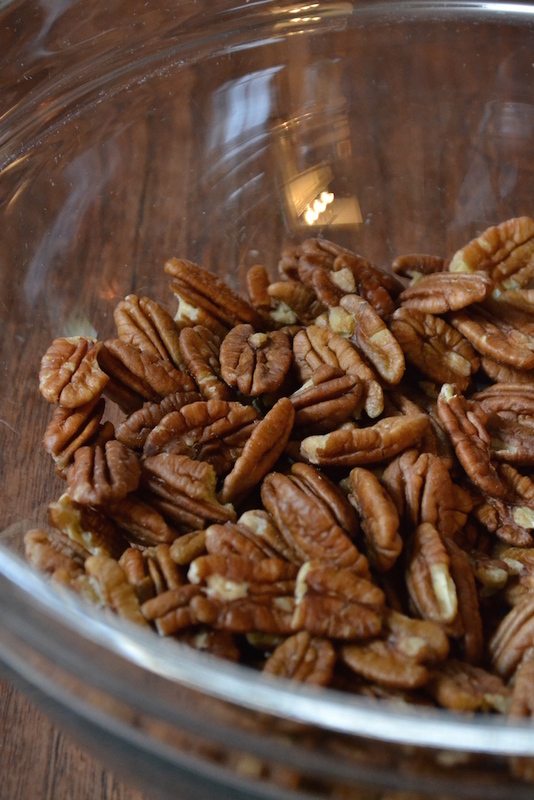 If pecans are touching, they won’t crisp up as well. Preheat the oven to 350 degrees. Cover a baking sheet with parchment paper and spray the parchment paper generously with cooking spray. Toss the pecans, sugar, and the egg white together in a large bowl until combined. Spread the pecans on the greased baking sheet and bake for about 12 minutes or until the pecans appear to be dry and are just toasted. Let the pecans cool on the baking sheet. Candied pecans can be stored in an airtight container for one week. I am going to make the candied pecans, maybe adding some gingerbread spices.